There is no debate about J. Scott Wunn’s mission and his good works. Since 2003, Wunn has been the executive director of the National Speech & Debate Association. With the goal of giving all students access to speech and debate, Wunn has made significant advancements in coaching education programs, community-related program development, and communication and cooperation among the Association’s leadership. Audrey Mann Cronin: No doubt this election and our new administration have reinvigorated the importance of debate – talking through controversial issues respectfully and with reasoned arguments. As the Executive Director of the NSDA, what do you see as your role in helping coaches and their students be great debaters and leaders? J. Scott Wunn: We believe that communication skills are essential for empowering young people to become engaged citizens, skilled professionals and honorable leaders. 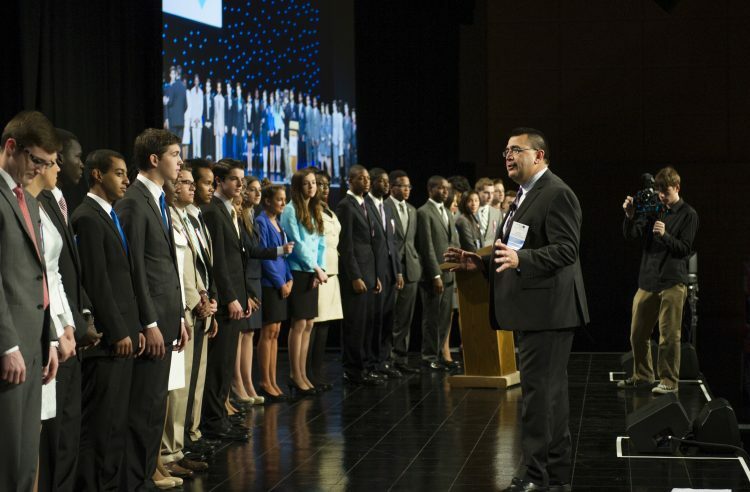 The role of the NSDA is to connect, support, and inspire our members to become good communicators through competitive speech and debate activities inside and outside of the classroom. We provide competitive speech and debate activities, scholarships, advanced recognition, and comprehensive training to thousands of speech and debate coaches, teachers, students, and alumni across the country. From lesson plans to practice tips and techniques, we have created more than 1,000 tools and resources coaches and teachers can use to effectively teach this life-changing activity. Additionally, for the last 90 years, the NSDA’s Honor Society has been recognizing student and coach achievements in speech and debate. Students and coaches earn points in the honorary through community service, leadership, public speaking, and participation in speech and debate. Recognizing student achievement not only expands their skill set, but encourages students to further their education and reach their goals. AMC: Debate is all about reasoned argument – a public, in-person, way to discuss opposing views and controversial issues. Has our smartphone-addicted, texting-instead-of-talking, digital culture impacted the world of debate? What are the positives and negatives? JSW: The use of the internet and smart phones has completely changed communication over the past 5 – 10 years. While it’s easier than ever to access information at our fingertips, it’s more important than ever before to teach critical thinking, interpersonal skills, sound research and analytical skills. Speech and debate does just that by focusing on reading, writing, speaking, and listening. Utilizing these skills teach students the value of critical thinking, the ability to clearly articulate thoughts and ideas, to answer questions logically with clarity, to think on their feet, be creative, and utilize collaborative skills. Students learn valuable life-long skills like conflict resolution, assertiveness, and respectfully listening to your peers; all things you can’t learn by communicating solely through a smart phone or online. These skills will benefit them far beyond high school and will no doubt make our world a better place. AMC: We tell our kids to practice so many things – piano, soccer, dance – but how about practicing our speaking skills? With LikeSo, I wanted to use emerging technology to give everyone an engaging and effective way to practice. Do you think there is a place in debate for apps and tools like LikeSo, and if so, what are a few ways that LikeSo can be used as a teaching tool for speech coaches and a practice tool for their students? JSW: The LikeSo App is extremely beneficial for all of our members. It’s a great tool to reinforce what our coaches and teachers are working on every day inside and outside of the classroom. One of the most beneficial areas of the app is the speech fitness tracker. Our members utilize speech quality points and their speech condition score to help them set specific goals, track their progress, and measure their success. The TalkAbout mode is extremely helpful for our debaters. It provides the opportunity to talk about a specific topic on the fly, just as they would during a debate tournament. Our speech members enjoy the FeeStyle mode to fine-tune their speeches and performances before competition. Being able to track their progress is a great motivator for success.